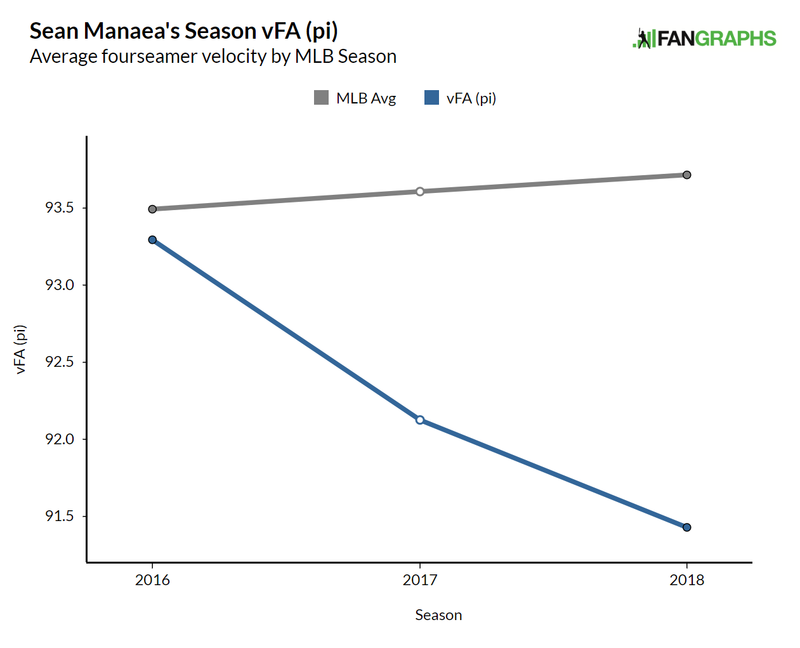 This is Jake Mailhot’s fourth post as part of his May Residency at FanGraphs. A lifelong Mariners fan, Jake now lives in Bellingham, Washington, just a little too far away from Seattle to make it to games regularly, which is sometimes for the best. He is a staff editor at Mariners blog Lookout Landing. He can be found on Twitter at @jakemailhot. Read the works of all our residents here. Among the various career arcs in professional baseball, the conversion from starting pitcher to reliever is one of the more common ones. It’s a last resort for aging veterans and a tried-and-true way to get the most out of middling starters. But when a talented prospect is moved to the bullpen, there are bound to be questions. It has been generally understood that a starting pitcher is more valuable than a relief pitcher, so teams are usually more conservative with their prospects, often letting them at least try to work things out as a starter before pulling the plug. But in an era when relievers are throwing more innings than ever before, a high-octane reliever might prove to be more valuable than just another starter. Back in 2016, the Mariners moved one of their best pitching prospects from the rotation to the bullpen. Edwin Díaz took to the conversion quickly and was in the majors a few weeks later, completely skipping Triple-A. He was soon installed as the Mariners closer and has been one of the best relievers in the majors since. His already excellent fastball velocity received the usual boost from shorter stints on the mound, and his slider has developed into a plus-plus pitch. It was a risky move for the Mariners. Instead of letting the 22-year-old try to develop his changeup in the rotation, they shifted him to the bullpen and aggressively promoted him because the major-league team needed bullpen help desperately. I wondered if any other teams had tried something similar. Below you’ll see the results of a very specific query: every relief pitcher who has thrown at least 10 innings in the majors and had been a starting pitcher in the minors as recently as last year. To narrow the field even further, these pitchers all recorded fewer than five innings pitched in Triple-A and have posted an average leverage index greater than 1.25 when entering the game. It’s an interesting list. Jordan Hicks, the man with the fastest fastball in all the land, sits atop it with almost 27 innings pitched and just 16 strikeouts to his name. Then we have a Rule 5 pick, Brad Keller, who has recently been in the mix for high-leverage innings in the Royals bullpen. Moving on. Justin Anderson wasn’t a highly regarded pitching prospect in the Angels organization, but he has added more than 6 mph to his average fastball velocity out of the pen and given Mike Scioscia another option in his constant closer carousel. This article was almost about Anderson. But the final name on the list is far more intriguing — and not just because of his 80-grade baseball name. 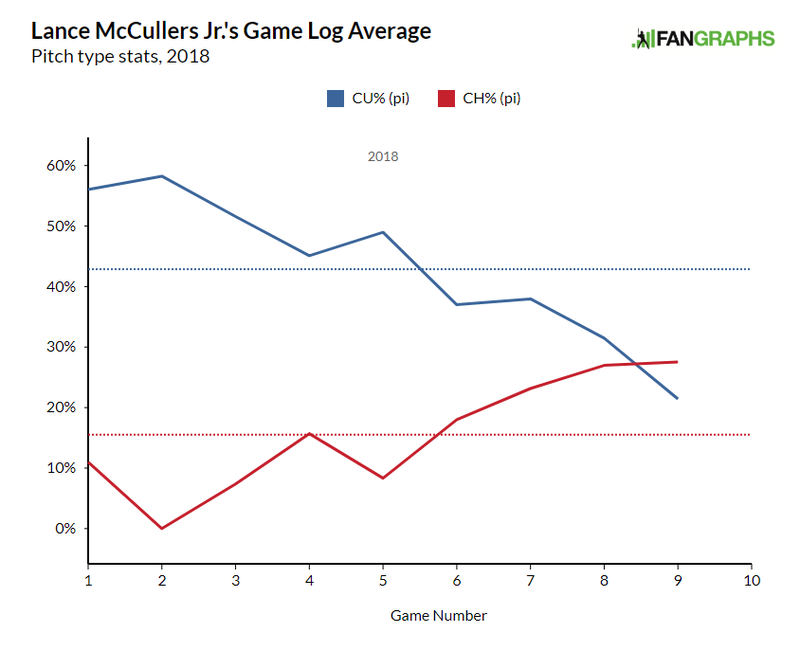 This is Jake Mailhot’s third post as part of his May Residency at FanGraphs. A lifelong Mariners fan, Jake now lives in Bellingham, Washington, just a little too far away from Seattle to make it to games regularly, which is sometimes for the best. He is a staff editor at Mariners blog Lookout Landing. He can be found on Twitter at @jakemailhot. Earlier this year, Jeff Sullivan wrote a pair of articles, each about a pitcher who appeared to be McCullersing. That term, of course, is a reference to Lance McCullersJr., who in 2016 began throwing his excellent curveball more often than his fastball. He’s led all of baseball in curveball usage since then. He wound up throwing his curveball an astonishing 75% of the time in Game Seven of the ALCS last postseason. That appearance was peak McCullersing. He started off this year throwing his curveball around the same amount as last year, 48% of the time. But when the calendar flipped to May, something changed. Just look at this graph of his secondary pitch usage in 2018. That’s… interesting. In his start last night (not included here), McCullers threw his curveball around 40% of the time. That’s pretty normal for him. But it’s been less normal for him of late. In his start against the Angels last Monday, McCullers actually threw more changeups than curveballs, the latter pitch representing just 21.4% of his total count for the night. The last time his curveball usage fell below 30% was all the way back on August 3, 2015, during his rookie year. This is Jake Mailhot’s first post as part of his May Residency at FanGraphs. A lifelong Mariners fan, Jake now lives in Bellingham, Washington, just a little too far away from Seattle to make it to games regularly, which is sometimes for the best. He is a staff editor at Mariners blog Lookout Landing. He can be found on Twitter at @jakemailhot. There has been no shortage of remarkable relief performances during the first month of the season. Jordan Hicks and Tayron Guerrero are playing a game of one-upmanship with their fastballs. Josh Hader is striking out basically everyone he faces. Adam Ottavino resurrected his career in an abandoned storefront. But the most impressive performance of all might be what Edwin Díaz accomplished in April. The ninth batter Díaz faced this season was also the first to actually put the ball in play — he’d struck out the first eight. Seven appearances into the year, he finally gave up his first hit, a single to Jed Lowrie. He gave up just one other hit the entire month. Among pitchers who’ve thrown 10 or more innings, possesses the fourth-highest swinging-strike rate and has produced the lowest overall contact rate when batters actually swing. If you prefer more traditional accolades, he’s also leading the majors in saves. His performance earned him the April AL Reliever of the Month Award. Any way you slice it, Díaz has been pretty great so far. Díaz has shown flashes of dominance like this before — his 2016 rookie campaign was good for 1.9 WAR on the back of a 2.04 FIP — but he’s always been a little too erratic for his own good. Some of his success in April came despite the inherent chaos of slinging a projectile at 98 mph. He’s already walked nine batters and hit three more, and he’s given up a pair of home runs in May already. A quick look at his plate-discipline stats reveals that Díaz is throwing in the strike zone at the lowest rate of his career, around six and a half points lower than last season. And he isn’t really inducing any more swings on those pitches out of the zone — in fact, batters are swinging far less often at his pitches overall. But again, when batters do swing, they just cannot make consistent contact. Díaz’s contact rate of 55.2% is better than Aroldis Chapman’s, Josh Hader’s, and everyone else’s. So what has made Díaz so effective this year when he does find the zone?